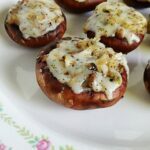 Stuffed Mushrooms: loaded with mozzarella and parmesan! 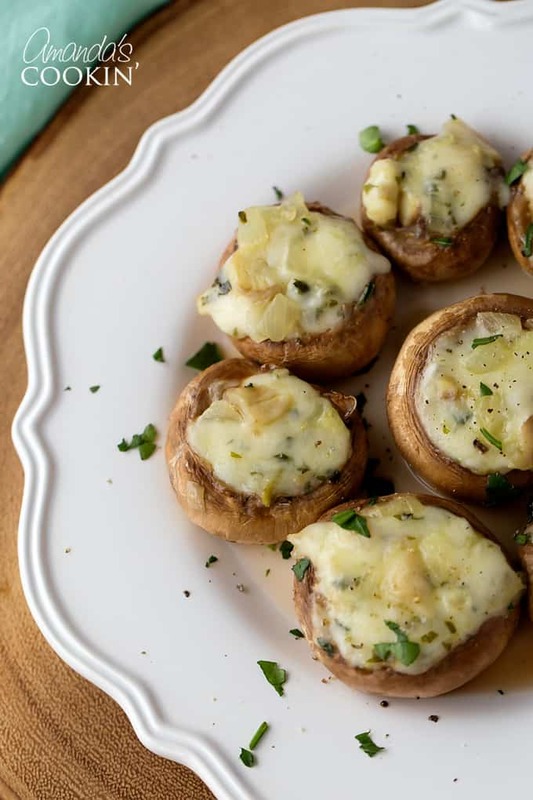 These Stuffed Mushrooms are so easy you could whip up a big tray of them in 30 minutes. 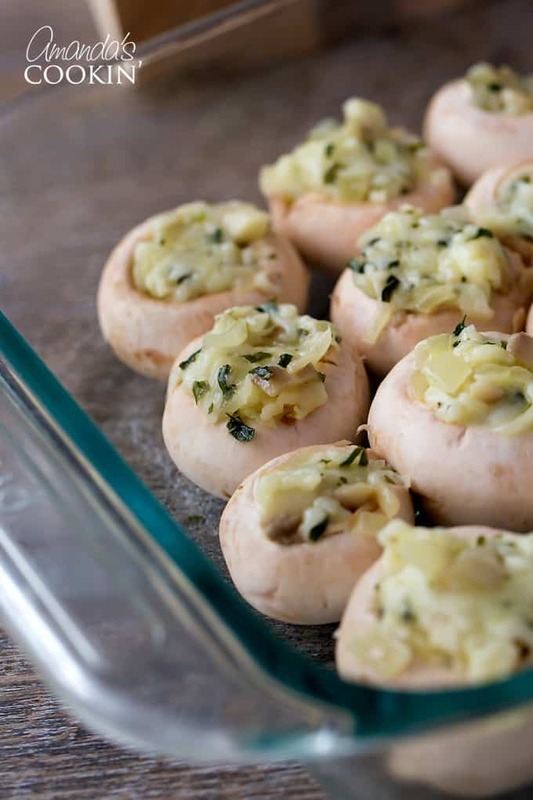 Right before your guests arrive you’ll have a batch of these stuffed mushrooms ready to go! Mushrooms are one of my favorite vegetables, so anytime I can try something using them I’m all over it, just like the time I made this Sausage Mushroom and Wild Rice Soup! 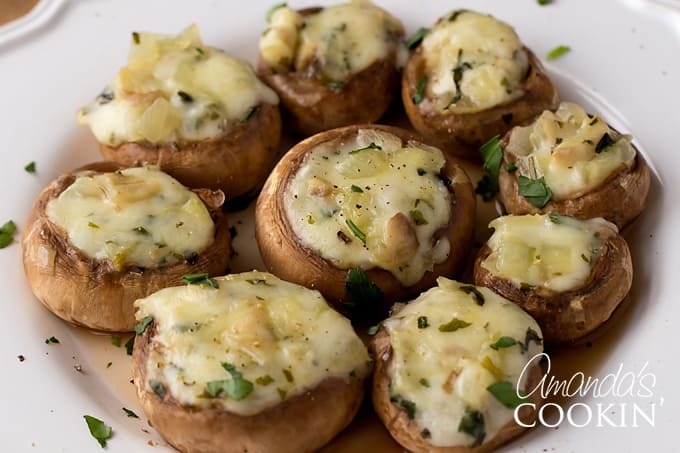 If you’re a mushroom fan like me, you’ll enjoy this recipe! I found this stuffed mushrooms recipe on the Sargento Cheese website. 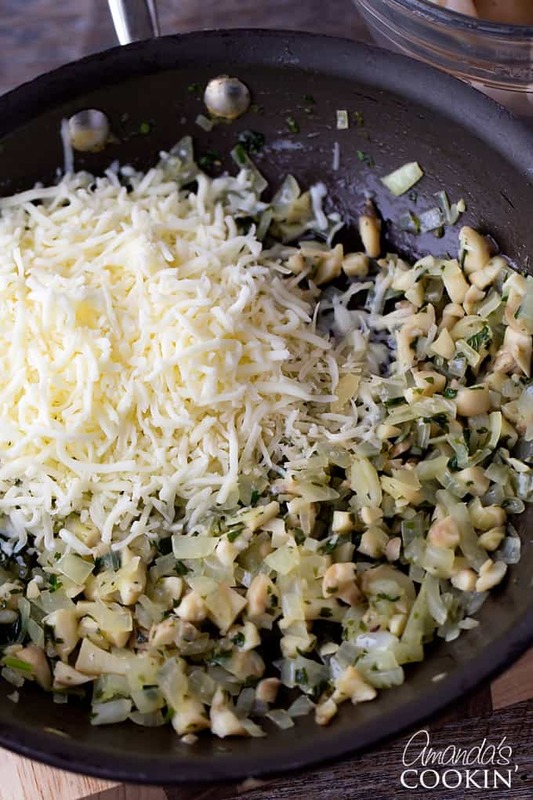 It uses Mozzarella and parmesan cheese which is a fabulous combination. You could try other combinations as well. What I liked best about this is how easy it was, and there are very few ingredients needed. These Stuffed Mushrooms couldn’t be easier! Remove the stems, chop them up and cook them in oil with the onion. Let it cool (I spread mine out on a plate for faster cooling) then mix with the cheeses. Stuff the caps and bake! I did lengthen the baking time by about 4 minutes, but you should follow the suggested time and check them first. Ready…Set…Scarf! 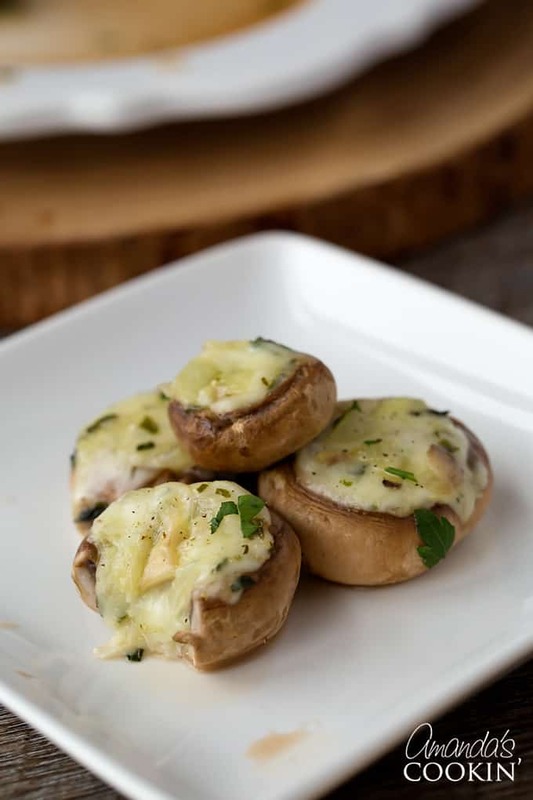 Enjoy your mozzarella and parmesan stuffed mushrooms because they won’t last long. Looking for more tasty appetizer recipes? Check out these…. This post was originally published on this blog on May 18, 2012. 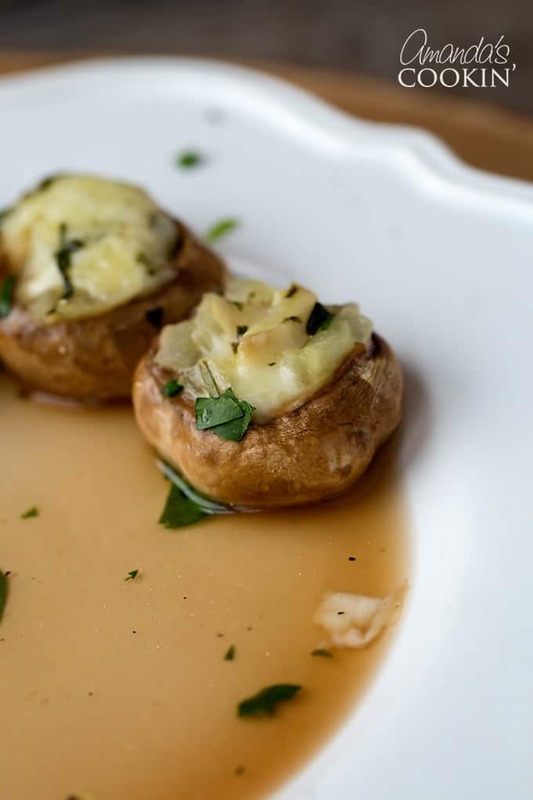 These Stuffed Mushrooms are so easy you could whip up a big tray of them in about 30 minutes, making the perfect savory appetizer! Remove stems from mushrooms; set caps aside. Coarsely chop stems. 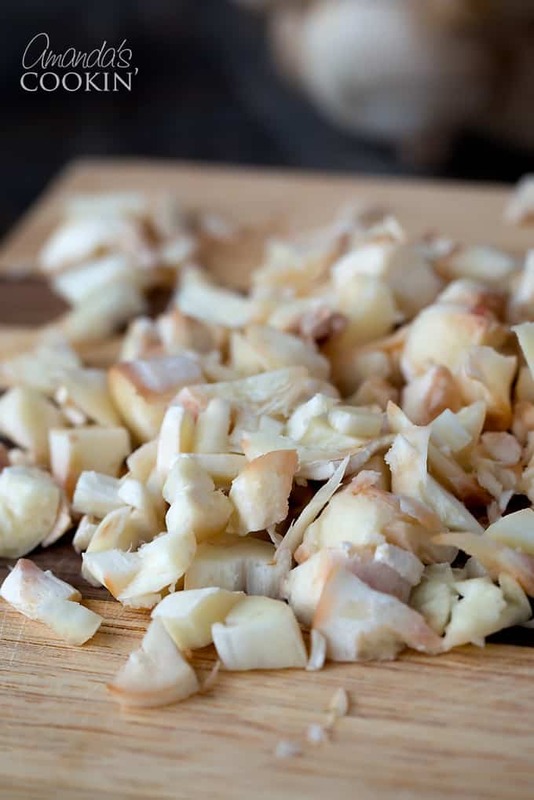 Cook chopped mushroom stems and onions in oil in large skillet over medium-low heat 5 minutes or until tender. Stir in parsley, basil and Vermouth. Simmer 10 minutes or until wine is absorbed; remove from heat; cool 5 minutes. Stir in cheeses. Fill mushroom caps with cheese mixture and place in 8×8-inch baking pan. Bake in preheated 350°F oven 15 minutes or until filling is hot and cheese is melted. Thank you so much for making a recipe for stuffed mushrooms that doesn’t have cream cheese in it! Mozzarella is so much better. I don’t have vermouth but I can work around that. Thanks Christine! You can substitute chicken broth for the vermouth, or any dry white wine. I made these today. They were extremely tasty. I didn’t have the Vermouth so I used a bit of red wine vinegar. I also added some green pepper. They look yummy-can’t wait to try making them.what can you use instead of vermouth? Fantastic. I used dry Sherry instead of Vermouth (just a personal preference). Great recipe. So glad you enjoyed them, thank you! BY THE WAY DAN IS SOO FUNNY !! I can’t wait to make you Mozzarella parmesan stuffed mushrooms. Looks so good I want them now, lol. I’m very happy for you Sargento reimbursement you, that’s great. I’ll make sure to use their products. Thank you very much for sharing your wonderful recipe.